Hi everyone! 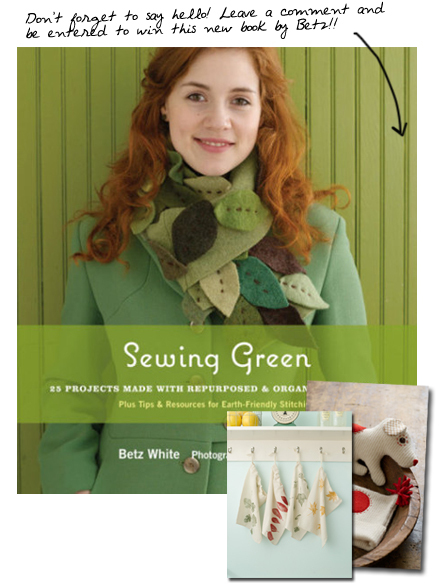 I'm so excited to be a part of Betz White's Sewing Green book tour. She's been so busy touring for the book so I truly appreciate her taking the time to write this post about ideas and the key to inspiration - something I think we can all relate to. So please give Betz a warm welcome... and make sure you say hi for a chance to win your very own copy of Sewing Green! I'll be picking a random winner! Giveaway closes 11pm EST so hurry! Speaking of letting go, a friend once told me that Einstein found that he had the best ideas just as he was drifting off to sleep. To leverage this, he would sit in a chair holding a ball in his hand and would proceed to take a nap. As he dozed off, his hand would relax and drop the ball. The theory was that when the ball would bounce, it woke him up and he'd be able to capture any ideas he had subconsciously. (By the way, I have tried to validate the truth of this story and have not been able to find any supporting information.) For me, napping in a chair holding a ball is not what would make me relaxed and happy, but a little catnap on the couch sure would. I find that a lot of ideas seep into my consciousness during my drifting off and waking up moments. See there? Now I've given you an important reason to nap. Part of coming up with fresh ideas is to look at things with a new perspective. Like the nap, taking a break from your task can do wonders for your creative mind! This feels so contrary to what you feel you should do. "I SHOULD stay and finish this, I'm so behind!" or "I almost have this figured out, I'll just try a little harder!". A smart designer/artist/creative person knows when it's time to STEP AWAY. Take a walk, go outside and get the mail, meet a friend for coffee, but whatever you do, allow yourself to have some separation. Of course I don't always follow my own advice (good grief, naps and long walks in the park? I've got a business to run!) but when I do, my subconscious creative side often rewards me. Be sure to visit www.melaniefalickbooks.com to get a sneak peek of Sewing Green! I view myself as a creative problem solver. I look at things and think, what can I make this into? (like some cool old neckties sewn into a water bottle sling) Or what can I use to make one those? (for example, I needed cake stands, so I decided to make some out of dishes) It's probably my background as a designer that leads me to be this way. I grew up looking at things in different ways and was encouraged to do so. I don't believe that people are necessarily born either "creative" or not. I think we all have the capacity to see something beautiful or interesting, such as a flower or a painting or a quilt, and feel changed and inspired by it. The key is to absorb these things and let them all become part of your experience. Then when you create and express yourself, all of those inspirations and experiences come together in your own way, that is yours alone. Being inspired by something is not about copying someone else's work, it's finding your own voice, telling your own story. Let the spark of inspiration be a springboard to your own creative discovery. Creativity is a fascinating topic and I am only able to scratch the surface here. Some fabulous research has been done on the creative process. For a few of my favorite books on creative thinking, please visit a special selection of books I put together in my "Betz White Book Shop". the book looks wonderful from the projects to the photography. That was really helpful. As an Architecture student, my life has been full of deadlines, stress and pressure to squeeze/generate fantastic ideas. It's very, very difficult to give myself an "me" time, or "hanging-out-with-friends" time, when ironically those leisure activities are the very thing that would help my design process. Hi! This is my first time at this blog, but I love it already! The book looks really interesting and inspiring! I want this book so badly! Thanks for doing this giveaway! Hi hi! I'm lovin' that fantastic scarf, and that very sweet looking doggie. What wonderful ideas!! I so want this book! I really am getting into repurposing things and replacing disposable products with reusable ones, so I really want to see what this book has to offer! finally saw this book the other day at my local bookstore. it's so lovely! would be so so excited to win. congrats on a beautiful book! this book looks so fresh and lovely! haven't had a chance to see it in real life yet, but i've no doubt it's amazing as i'm a fan of betz's work. and i think she went to my alma mater, U of Cincinnati! Hello! I have had some good ideas while drifting off to sleep too. And some of my most creative/clever ideas have come from not having exactly the right thing handy - so I used what I had available at the time. Thanks Betz! This is a gorgeous website! So much useful information. Thank you for supporting us green artists! I've just started making envelopes from repurposed children's books and am having a blast. I'm so happy people like saving the environment as much as I do! I've recently picked up sewing and have loved it. I've been saving scraps of fabric (discarded ties, fabric belts, etc.) for "one-day" projects (like, One day I'll make something cool with these!). I'd love to see the ideas in this book to get me going. Great idea! love the book, what great ideas! count me in for the drawing! This giveaway is great! I have a bunch of vintage fabrics waiting to be used. This book looks pretty damn cool! What a wonderful book and the photography is gorgeous! I love it! Thanks ladies! Betz, thank you so much for writing this book! It is amazing and has been such an inspiration. I recommend it to all my crafty friends! I love this blog tour--I have found such great blogs that I might not have otherwise seen. Thanks for the article and giveaway! I've followed her entire book tour! Its nice to see new pages revealed each day. They make me want the book even more! Oh my gosh this book would be so helpful! I'd like to enter too please! I would love a book like this! I would love this book - I just started sewing and am still scared to do anything cause I don't want to 'ruin' the fabric! A book like this would make me forget the fear! I'm very much looking forward to pouring over this book, I've heard so many great things about it! I second Betz on the value of the 'step away', especially on such a gorgeous day! I'm really enjoying this blog/book tour.It's inspiring! Thank you both for the interview and the generous giveaway. Just to let you know, in case there was confusion...the 2 Tie Sling and Cake Plate projects are not in the book, just shown as results of inspiration. See tutorials for both on my blog. I always used "green" material in my quilting and sewing projects. Last year I bought the book with the cute pincusions made of felted sweaters. I love to have a copy of the new book . I would love to try out the projects in this book! They all look great. i heard that einstein story attributed to the earl of sandwich, with a spoon in his hand and a bowl for it to drop into, so who knows who it actually was! OMG I have had all kinds of ideas in the shower too. I think it's sort of like a sensory deprivation tank--kind of puts you in a state of mental emptiness so cool stuff can bubble up unimpeded. I have thought I should put a laminated notepad and grease pencil in there for when I think of something good, but I would probably run out of hot water. The book looks great--I'd love to win one! I'd love to win... I haven't used my sewing machine in months and it would be the perfect excuse to drag her out again. Awesome! I try to keep green, but I just heard that sea level is going to rise 23 feet in the next four years, and I live on the coast, so I need to be greener!!! Such a cool-looking book...I've followed Betz on her blog for awhile and am craving this book! Thanks for the giveaway. I'm trying to get "back to my roots" and do a lot more thrift store shopping. I've signed up for a 6 month wardrobe refashion. This book would be a great help to keep me on the right track! HI - I've been really enjoying your book tour and great tips, thanks so much for all the sharing! I would love some ideas on how to use the loads of fabrics lying around my place! Looks like a great book! I use mostly used fabrics, but it's only so much you can make of old pillowcases ;-) I would love some fresh ideas, and by the look of it...this book has a lot of them! I'm big on the theory of creativity and dreams. I don't think it was Einstein, though that would be cool. I heard it was Thomas Edison. Hello! This book looks amazing! Re-purposing items and materials is such a lovely idea. Your brand new creation then gets imbued with all the history belonging to its materials. I would love to read your book! I love her work and would love a copy of her book! This book have lot of collection of great ideas.well done you did nice work.